My earlier blog summarised some key findings from WHO reports about NCD prevention and control globally and in the Asia-Pacific region. What does the recently released WHO NCD Progress Monitor 2017 report reveal about the NCD challenge in the Pacific? 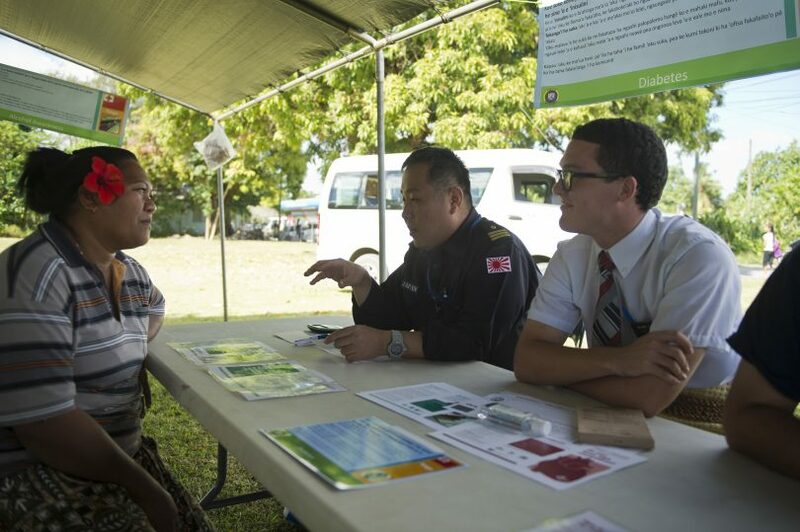 First, it confirms the importance of NCDs as a source of death in the Pacific. NCDs now account for over 80% of all deaths in Fiji, Samoa and Tonga; over two thirds of all deaths in the Federated States of Micronesia, Solomon Islands and Vanuatu; and over half of all deaths in Papua New Guinea. Second, Pacific Island countries (PICs) have a relatively high risk of premature (i.e. between 30 and 70 years of age) deaths from any of the four main NCDs: cardiovascular disease, diabetes, cancers and chronic respiratory diseases. Premature deaths are important because they can usually be prevented or at least postponed, and they affect those of working age population. 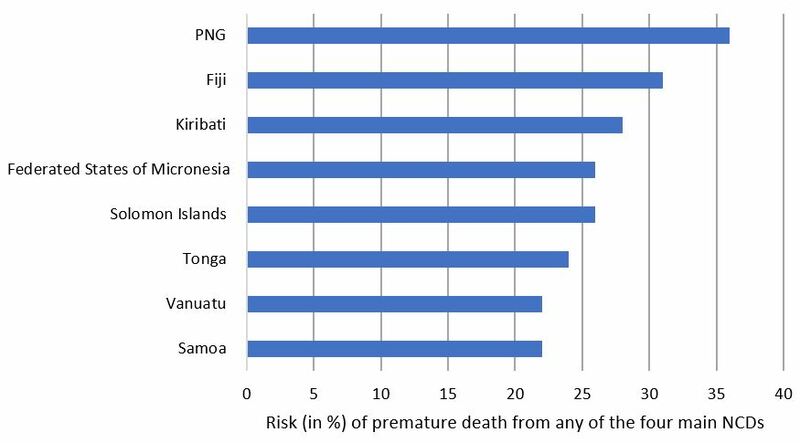 Graph 1 below shows the risk of premature deaths from any of the four main NCDs for those countries in the Pacific for which estimates are available. Importantly, WHO also states that PNG’s population has the highest probability – out of 194 countries in the world – of dying prematurely from any of the four NCDs. There are inevitable data and methodological limitations in making such an important finding. 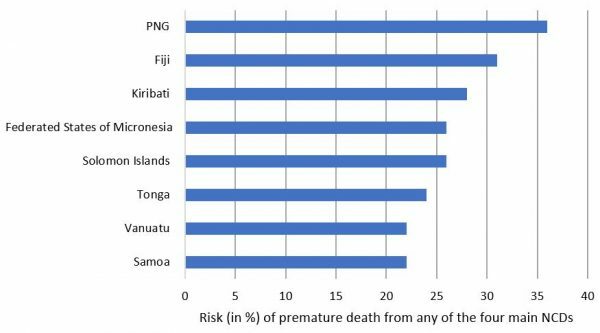 For example, there are rarely estimates of the risk of premature NCD death for countries with a population of less than 200,000, several of which are in the Pacific and which may have even higher probabilities than PNG of premature death from one of the four NCDs. Nevertheless, what can be said with confidence is that relatively high levels of risk factors in PNG, combined with relatively low access to NCD prevention and treatment, highlights the particular challenges in responding to NCDs in PNG. A recent Devpolicy blog post also notes PNG has the highest rates of malignant mouth cancer in the world. It is not just PNG that has a high risk of premature death from NCDs. Fiji is estimated to have a 31% risk of dying prematurely from one of the four NCDs. This makes Fiji (along with Afghanistan and Turkmenistan) the third highest country in the world for premature NCD-related deaths after PNG (36%) and Turkmenistan (35%). Furthermore, as Graph 1 shows, all eight PICs for which data is available have a more than a 20% risk of dying prematurely from any of the four NCDs. To put all this into context, WHO states that the lowest probability of NCD premature death among lower-middle income countries globally is 14% (occurring in both El Salvador and Honduras) and among upper-middle income countries globally just 11% (in Costa Rica). Third, as highlighted in my earlier blog, PICs are making only mixed progress in terms of policy and investment interventions to manage the rise of NCDs. Fiji and Vanuatu were the best performing countries in the Pacific, making it into the top 50% of countries worldwide. Other countries are in the bottom quarter “fully achieving” 6 of the 19 indicators for preventing and managing NCDs in 2015. However, PNG is recorded as “fully achieving” only 1 of 19 indicators – the introduction of smoke free policies – although PNG did partially achieve six other indicators. The Federated States of Micronesia (FSM) is assessed as not “fully achieving” any of the 19 indicators in 2015 (although it did partially achieve four indicators). This puts FSM in the same bottom league as five other – poorer – countries: Angola, Equatorial Guinea, Guinea-Bissau, Sao Tome and Principe, and South Sudan. Fourth, the WHO report suggests that Pacific Island countries are generally doing quite well in some areas, less well in others. More specifically, 12 of the 14 Pacific Island countries for which data is available have fully, or partially, established their own time-bound national NCD targets (Niue and Samoa had not in 2015 at the time of the survey). And 13 of the 14 PICs have fully or partially carried out regular surveys of risk factors for NCDs (Marshall Islands had not at the time). All 14 PICs have fully or partially achieved at least some aspect of tobacco control. On the other hand, Fiji is the only PIC to have “fully achieved” the goal of having a functioning system for generating reliable cause-specific mortality data on a routine basis. And surprisingly, given the risk factors for acquiring NCDs especially in the Pacific, no PIC has fully achieved the goals for reducing unhealthy diet (including salt reduction), and only four countries have fully achieved the goals for public education and awareness campaigns on physical activity (Fiji, Kiribati, Niue, and Tonga). In short, while progress is occurring, more needs to be done, particularly in the Pacific, which has relatively high risk factors and prevalence of NCDs. Fortunately, there is some positive news about NCDs coming from recent research. An article in The Lancet, found that effective and sustained weight loss in the UK could lead to remission of Type 2 diabetes, with patients no longer needing drugs. This has some interesting policy implications for all countries, including middle-income countries. For example, the successful interventions all occurred in lower-cost primary care settings, not hospitals, and did not require bariatric surgery. Furthermore, the degree of remission in diabetes was directly related to the extent of weight loss: 86% of the 36 patients who lost 15 kg or more achieved remission from diabetes, the percentage was smaller for those who loss less weight, but none of those who gained weight achieved remission. Other research (see here and here) highlight the individual and public health benefits of detecting, preventing, or at least postponing early-onset type 2 diabetes – a challenge in many middle-income countries. This is because early-onset type 2 diabetes in adolescent and younger years is associated with significantly worse health outcomes compared to adult onset diabetes, including premature death from cardiovascular disease. A third recent positive is the announcement that the Minister of Health and Public Enterprises in Tonga, Dr Saia Ma’u Piukala, has been appointed a member of the WHO Independent High Level Commission on NCDs. This gives a voice to the Pacific in the High Level Commission on NCDs as it plans and prepares for the Third United Nations High Level Meeting on NCDs to be held later this year. In summary, NCDs remain a major health – and development – challenge for countries globally, especially those in the Pacific. There are public policy interventions that can avert, or at least postpone, some of the worst consequences, but much more needs to be done, and quickly.